Yes. I am still alive. Yes. I am LOVING being back in Alaska, my job, and all the adventures that both provide. Yes. I still blog (albeit very infrequently these day). Hoping to change that soon. I figured I’d jump back in to the blogging world with a short, fun post. Just my style! 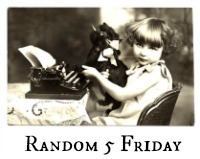 Welcome to my first Random 5 Friday. 1. I haven’t picked up my “Big Girl” camera (Nikon D90) in weeks. My iPhone 5 is now my go-to camera of choice; mostly because of its convenience (read: SO much easier to carry around than my huge DSLR!). 2. The lodge opened a little over two weeks ago to snow and freezing temps. Flash forward to today and we are in the low 80’s. Overnight the trees started to sprout leaves and there are even hints of the famous Alaska wildflowers showing here and there. 3. We are beyond excited to be getting a new car. We won’t be buying anything until July, but I can already feel the wind in my hair; hear the blasting radio (well…not too loud. I hate loud music), and see the stunning scenery along Alaska’s Parks Highway. I won’t like having a car payment again, but living in the sticks demands transportation in order to maintain some semblance of sanity! 4. So far this season I have met a Snowy Own, Great Gray Owl, and a Bald Eagle. The bird program at the lodge is awesome! 5. I’ve never been a big coffee drinker, but living in Bulgaria and now having access to barista-made coffee drinks daily (at our espresso bar) have made me a convert. Feel free to link up your own R5F post below. Categories: About Me, Alaska, Animals, Flora and fauna, Fun-Times, iPhone, Lately, Photography | Tags: about me, Alaska, Friday, iPhone, lately, random, Random 5 Friday, Travel | Permalink. I am slowly but surely going through all my photos from our vacation, so expect lots of posts soon. Tonight, however, I had to put up a quick post about the infamous feline residents of Sacra di Largo Argentina or Torre Argentina, an area of important ruins in central Rome. The second the audio started I knew they were talking about an area Vince and I happened upon during our walk about the city a few weeks ago. At first glance the spot is typically Roman: ruined temples, crumbling walls, column remnants, etc. But then…BAM! You suddenly begin to notice one cat after another. I’m talking about dozens upon dozens of cats in a one block area. Spotting them was almost like playing an odd version of Where’s Waldo. They were mostly napping (some in a clump under a tree) on this particular day, but a few were stalking the darker recesses of the ruins, no doubt on the hunt for some rodent snacks. Categories: Animals, Culture, Flora and fauna, News, Travel, Videos | Tags: Argentina, cat, cats, Feral cat, Italy, NPR, Photography, Rome, Sacra di Largo Argentina, shelter, Torre Argentina, Travel | Permalink. In case you couldn’t tell from my last few posts, I have left my beloved Alaska and ventured back to my home state of Utah. I made a brief (and super stressful) stop in Los Angeles for one night to visit the Bulgarian Consulate to apply for my long-stay visa (detailed post to come). I cannot believe how fast the summer went by. Denali, as always, was a blur of fun times, stress, and craziness; and I am sure going to miss it. I’ll be slummin’ it at my mom’s house (sleeping on an air mattress in my bedroom) for the next month before jet setting back to Bulgaria. A certain handsome Bulgarian man is eagerly awaiting my arrival, and I his amazing hugs and sweet smell. Watching: You name it. After nearly 5 months of little to no internet (which meant no Hulu, YouTube, etc. ), I am more than catching up on my fair share of mindless entertainment. I only have a short time to watch everything before going back to Bulgaria, land of crappy website access. Specific favorites include New Girl (love me some Zooey Deschanel), The Office (it’s the last season, *tear*), House Hunters International (did I ever mention that I was contacted by the casting director for this show about Vince and I doing an episode? HA! All I could do was laugh and politely decline. As much as I love watching the show, I am not the type to be on the show) , and of course, hours of beauty gurus, music videos, and vlogs on ‘The Tube’ (YouTube). Listening to: Similar to my round-the-clock catch-up on TV and the internet, I have also been listening to music like crazy. It’s awesome having Spotify back regularly. A few specific artists/bands that I have been enjoying lately are Mumford and Sons (sorry if you are tired of hearing me talk about them! ), Foster the People, The Decemberists, Bon Iver, Of Monsters and Men, and Augustana. I’m working on another ‘On Rotation’ post, so stay tuned for that! Eating: I actually haven’t gone as nuts as I thought I would in the food department since being back in UT. That will likely change as my departure to Bulgaria gets closer. As much as I adore Bulgarian food, there are just some things from home that I dearly miss when I am away. Wishing: OK, it’s more like PRAYING that my long-stay Bulgarian visa arrives before my flight in November. I think I may have booked my departure date too soon. The consulate said the visa will take about 30 business days; my flight is on the 31st business day. Holy. Schnikies. Please send good vibes my way! Paying to change my flight is the last thing that I need right now! Well. That’s all for now, folks! As always, thanks for stopping by my little corner of the blogosphere. Categories: About Me, Alaska, Blog, Bulgaria, Expat Life, Flora and fauna, Lately, Marriage, Moving, Utah | Tags: Bulgaria, currently, expat, expat life, lately, moving, Sofia, updates, Utah | Permalink.